It turns out, by the way, that the first Wonder Woman: The Rebirth Deluxe Edition does intersperse the issues of Wonder Woman Vol. 1: The Lies and Wonder Woman Vol. 2: Year One, returning them to publication order. That's a more important point for this present volume, Wonder Woman Vol. 4: Godwatch than it is for those, given that Godwatch ultimately intersects in the present with Wonder Woman Vol. 3: The Truth. I didn't know Godwatch contained, essentially, a Truth chapter and I didn't miss it in reading Truth, but clearly the proper way to read this story is in the interspersed publication order. Godwatch therefore turns out to be a very Veronica Cale-centered trade, not that there's anything wrong with that. 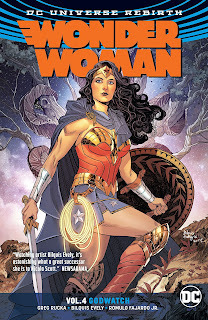 I could caterwaul about how Greg Rucka's final Wonder Woman collection of this run doesn't really even involve Wonder Woman all that heavily, but I know now some of this is the vagaries of the collection order, to be rectified in the deluxe. It remains that Cale was one of the best parts of Rucka's original Wonder Woman run, a scheming, mortal, and highly intellectual new foe for Diana. With Rebirth, and in Godwatch especially, Rucka recasts Cale as perhaps no less corrupt but now more sympathetic, forced into her bad deeds through a variety of impossible choices. The fourth chapter, Wonder Woman #22 with art by Mirka Andolfo, is especially well done, a date night between "frenemies" Diana and Cale that reminds of Smallville's Clark and Lex or where I imagine Supergirl's Kara and Lena will end up. All of it, of course, leaves me wanting more from Rucka on these characters, just at the point that he makes his exit. Though we understood all of this to an extent after Truth, Godwatch brings into sharp focus that Cale's daughter was kidnapped and tortured by the gods Phobos and Deimos, and that Cale is forced to cause a number of injuries to Wonder Woman and her friends to try to get her daughter back. If we compare Cale and Diana, as Rucka invites us to do, then Cale's "villainy" perhaps was to go along with the gods -- harming a number of innocents including Barbara Ann "Cheetah" Minerva -- rather than seek Wonder Woman's help to begin with, though with omnipotent gods monitoring her and her daughter's life at stake, it's not wholly clear what Cale might have done differently. This is Rucka's triumph this time around, that despite a certain callousness regarding other people's lives, Cale is not a traditional villain, and her dislike of Wonder Woman is surely less surface level than it was the first time. It's notable that Cheetah names Cale a "villain" in the conclusion; if anyone has a right to call Cale a "villain," it's Cheetah -- whom Cale subjected to significant torment -- but in reality Cale is no more a villain than Cheetah is, both of them forced on their bad paths by others (and specifically, each women who've been wronged by men). Moreover, in all of this rewriting, Rucka really has now made Cale into Diana's arch-nemesis, placing her at the beginning just after Diana's battle with the faux-Ares and positing Cale as behind the creation of the Cheetah if not also some of Diana's other foes. In Rebirth it's hard now to recount Diana's origin without including Cale as well. Bilquis Evely offers fine work here, rather calmer and more staid that Nicola Scott before her, and with a particularly classic-looking Diana. It's no knock against Evely then that Mirka Andolfo's work stands out for its difference in Godwatch's fourth chapter, still smarter and hipper than DC's standard fare but with more bubbly animation, a la Amanda Conner. The issue itself is Rucka's masterpiece in terms of the new Diana/Cale relationship, in which Cale buys a fifteen million dollar date with Diana first seemingly just to interview her, then to trick Diana into foiling an attempt on Cale's life, but really to continue to try to discern the location of Themyscira. Like another of DC's power couples, Hal Jordan and Sinestro, we see clearly here how Diana and Cale share many of the same goals and philosophies, how they're intellectual equals, and yet how their paths cause them to differ. It's a fantastically layered chapter, and the change in artist from Evely to Andolfo underscores it as something special in the book. For those playing along at home, in the closing chapter of Wonder Woman's inaugural Rebirth storyline, the book well and truly puts the final nail in the coffin of Diana's New 52 adventures (even if we still don't know whether she was born of clay or not). For one thing, Rucka draws out Diana's encounters with Cale over ten years, with "ten" being a significant number because it leans more toward the ten years apparently stolen from the DC heroes than the purported five years of the New 52 (technically Diana "can't" have been around ten years, but no doubt Rebirth will solve that soon enough). We might posit this all takes place in the aftermath of Superman Reborn given that Superman appears in his newest costume, but the story Rucka tells is when they first met, suggesting the elimination of Superman's red trunks from continuity -- except we've seen them in this new reality in Action Comics, so Rucka's story is clearly erring. This retelling of Superman, Batman, and Wonder Woman's first meeting also modifies Justice League Vol. 1: Origin, which I thought DC was keeping, so clearly again we can't take this book's word for it. At the beginning of all of this I found Greg Rucka's use of Veronica Cale self-serving (and Sasha Bordeaux, happy as I was to see her); there's a difference between going home again and telling the same story over. But ultimately it never seemed Rucka got to do quite all he wanted in his first Wonder Woman run, and in Wonder Woman Vol. 4: Godwatch, he accomplishes the rare do-over with Veronica Cale that improves on the original. Yes, this book is light on Diana when we'd like to cling to every moment of Rucka writing her that we can get, but Godwatch reiterates Rucka's strength as a writer overall, as if we needed that reminder. Here's hoping there's another project coming for Rucka's at DC, and that it's announced soon. I just got this TPB and honestly I don't know how to feel about it. When I first started reading it I got the feeling I already knew most of it and unlike the second volume this doesn't read as well on its own. Although it had a powerful emotional story it felt like something was missing. I'll reread the 4 books with the issues in numerical order later and maybe that will make it better (and if they do I'll probably get the HC). I don't like that they placed the epilogue in this book and not the previous. If you're going to separate them, do it properly. But most of all, I don't like that they only partially print the Annual. They did it with Batman and now again with Wonder Woman. I'm also wondering how the story from the Annual effects Justice League: Origins, I'm assuming this takes place shortly after it with the 2 of them wanting to learn more about the more mysterious member that has links with the military. So all in all, they were great stories but it just doesn't work as a stand alone TPB. The rest of the annual will be collected in Vol. 5 along with Shea Fontana's arc (issues #26-30) and the Steve Trevor special by Tim Seeley. In my opinion they should have placed it in here and moved issue #24 to Volume 3. This TPB is just weird to read. I get that they wanted a 100% Greg Rucka book, but collecting it like this makes it a bad TPB despite the great writing.